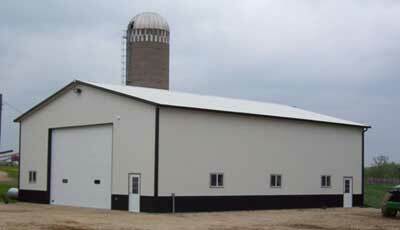 Custom Builders of Tipton, Iowa (the sister company of Vittetoe, Inc.) is a full line building company. 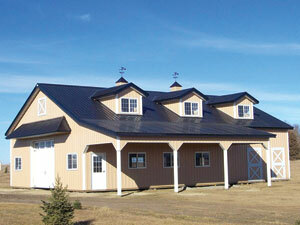 Custom Builders has available a multitude of commercial and agricultural buildings along with housing. 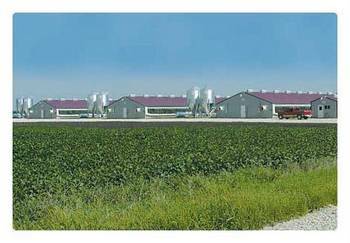 This wide range of construction experience includes: Butler Steel Span Commercial Buildings, EPS Post Frame Commercial Agricultural and Residential Buildings and EPS Post Frame Livestock facilities. Along with several years building experience in the ag and commercial buildings, Custom Builders also now has residential housing capabilities. 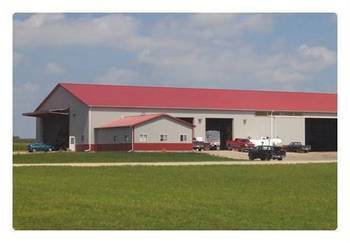 Custom Builders of Tipton, Inc.
EPS is a recognized leader as a manufacturer of pre-engineered buildings which are custom designed to fit your needs and then built for you by our network of professional builders. SIP construction is used for new home construction, commercial buildings and on the farm use in storage, shop or office buildings. Structural Insulated Panels join high performance rigid foam insulation to Oriented Strand Board (OSB) or plywood. The thickness of foam is adjusted to increase R-Value. Regardless of the final use, building with structural insulated panels gives the owner a high-performing energy efficient building. An EPS insulated panel walls are up to 15 times more airtight than stud walls. SIP construction offers great design flexibility with larger clear spans and high vaulted ceilings. 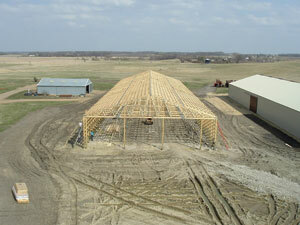 For those on the farm, EPS can engineer and manufacture a post frame or SIP building for any size and need. Use it has a horse barn, machinery storage shed or work area. 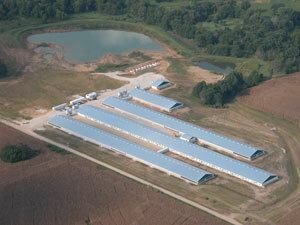 Our pre-engineered buildings are used for livestock, equestrian, poultry, dairy or storage needs. Post frame buildings can incorporate long span trusses to provide large open areas giving you flexibility for real world use. Our post frame buildings use laminated columns that are placed in direct contact with the ground or on concrete. These laminated columns are pressure treated with preservatives to increase their longevity. EPS posts carry a 50-year warranty. Whether you choose a post frame or SIP building, it is designed to provide a high value in ease and speed of construction, quality and durability of the final building. Our solid core panel structures are versatile. We'll help design the best possible solution to fit your agricultural needs. EPS can provide combination post-frame storage and Solid Core Panel walls in on ebuilding to enhance insulation and performance. Structural Insulated Panels join high performance rigid foam insulation to Oriented Strand Board (OSB) or plywood. The thickness of foam is adjusted to increase R-Value. Energy savings is measured in whole wall R-Value, not just insulation values. Our 6-inch core walls outperform standard steel or stick built walls by over 50%. Interior wall temperatures are much improved over stick or steel walls. Solid core walls have no sagging insulation, no compressed insulation, no air movement, only solid cores. With no thermal shortcuts to external walls, they simply translate to large savings on your utility bills. The results speak for themselves. Our core panel system is 15 times better at stopping air infiltration. This offers you a comfortable building by virtually eliminating drafts. Choose from the standard R-18, R-26, R-33 or R-40 walls. The colder the outside temperature--the better the R-Value. All types of buildings can be engineered in just about any dimension. EPS panel systems offer complete customization of roof materials. The most popular are trusses with purlins or structural insulated panels over the top of trusses which offer open attic designs. Shingles, standing seam roofs or virtually any roofing material can also be used. As with the roofing, siding options are also limitless. Brick, vinyl, cement board siding or just about any material is easily attached to our core panel surface. Impact resistance is another standard feature of structural insulated panels. The continuous bonding of EPS insulation to the OSB or plywood offers incredible strength and resistance to impact. EPS buildings are engineered with IBC codes to your wind and snow loads and can be stamped in 50 states. EPS has state-of-the-art production facilities and five truss lines to give you cost-effective solutions. 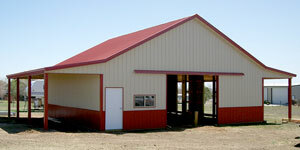 EPS is a manufacturer of pre-engineered post frame buildings. With a network of over 350 independent authorized dealers, we can connect you with experienced pole barn builders in your immediate area. 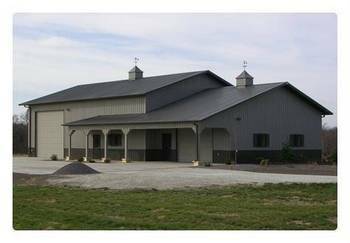 Whether your new pole barn construction (now called post frame construction) will be used for implement storage, horses or a work area, EPS can engineer and manufacture post frame buildings to any size and need. Our years of experience combined with the latest in technology goes into all or our entire pole building plans. EPS is a low cost producer and offers the widest possible product design at the most competitive prices. From 6' on center to 12' on center and from 30 lb. to 200 lb. snow loads -EPS has you covered. 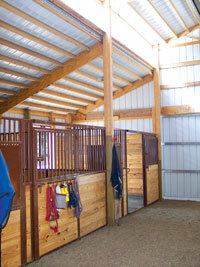 Our pole barn builders use laminated columns that are placed in direct contact with the ground or on top of concrete. These laminated columns are pressure treated with preservatives approved by the Environmental Protection Agency to increase their longevity. EPS posts carry a 50-year warranty. Every EPS pre-engineered building is evaluated for cost effective solutions, maximum performance and spans. Every customer will receive a guaranteed engineered structure to support optimal wind and snow loads. EPS will only sell engineered buildings according to current International and State Agencies building snow and wind loads, (IBC). Fifty-year warranty for treated structural posts for insects and decay. See actual warranty for all terms. 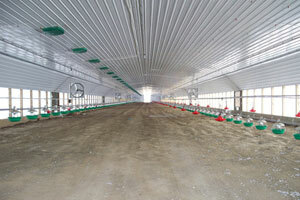 EPS is the leader when it comes to livestock confinement. The nation's largest integrators have chosen EPS with over 30 years of proven customers. Perfect for breeding, gestation, farrowing, nurseries, isolation, finishers, and more. expanded polystyrene core. The door perimeter is reinforced with wood capped with a heavy vinyl extrusion. The frame exterior is wood-covered with extruded aluminum.